1.) Yellow Pollen Street Festival – Hampton’s newly revamped Main Street serves as the host for its annual spring festival that celebrates good that comes from the sticky icky known as Georgia pine pollen on March 21st. 2.) Jonquil Festival – Smyrna’s twice-yearly festival takes it’s spring turn April 25th and 26th at the Village Green. Admission is free to the family-friendly event which will feature local artisans, numerous Cobb County restaurants, and a kids play area. 3.) Azalea Festival – Head to Valdosta March 14th and 15th for two full days of fun including a live tiger display by Tiger Stripes Animal Sanctuary, the Classic Car and Motorcycle Show, the Disc-Connected K9’s Frisbee Show, the Paul Bunyan Lumberjack Show, and the Wild Adventures Stage. 4.) International Cherry Blossom Festival – The entire city of Macon comes alive March 19th– April 4th with food, music, family-friendly fun, tours, historical exploration experiences, a parade, fireworks, and more. 5.) Forsythia Festival – Held the second weekend in March in Forsyth, the two-day event features a family-friendly weekend filled with an arts-and-crafts show, children’s fair, running races, live entertainment, and more! 6.) Another Bloomin’ Festival – On April 4th, downtown Metter comes alive with typical festival sights and sounds in addition to a celebration of Easter. For extra fun individuals and familes are invited to the Metter Municipal Airport for the annual Bloomin’ Fly-In. 7.) Conyers Cherry Blossom Festival –Former Olympic site the Georgia International Horse Park will host the 2015 version of the festival March 21st and 22nd in Conyers. Visitors will enjoy multiple stages of continuous entertainment featuring international music, dance, games, food, 300 arts and crafts vendors, children’s activities, and more. 8.) Atlanta Dogwood Festival – April 10-12 Atlanta’s Piedmont Park will host one of the city’s most beloved festivals- the Atlanta Dogwood Festival. Now in its 79th year, the festival will feature a nationally renowned-juried Fine Artist Market, Kids Village featuring huge inflatables, arts & crafts and face painting for all ages, as well as the ever-popular 24-foot rock-climbing wall. A wide variety of live musical entertainment and food will complete the festival experience. 9.) 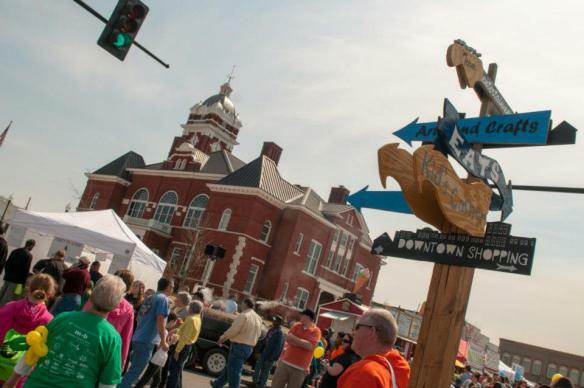 Perry Dogwood Festival – April 11th and 12th downtown Perry will feature a festival highlighting the best entertainment the town can offer including a hot air balloon rally, dog diving competition, arts and crafts festival, running events, fishing tournament, and flapjack fundraiser. 10.) Geranium Festival – Arts and crafts vendors from across the southeastern United States will gather just off 1-75 in McDonough to sell their wares on May 16th. Festival food, a children’s area, and a section highlighting local businesses all make this day family-friendly and fun.